The success of the internet has meant in more recent years printed media has taken a back seat to email marketing, but in reality its probably more important than ever to give you the personal touch. Depending upon the product, often the old ways are still the best. Knocking on customers doors, sending a brochure through the post rather than sending an email. Why? because people have to throw a brochure away but first they have to engage with the content. Think about it why do we still get leaflets in our papers? Of course brochures are still used at exhibitions, in local Post Offices, in banks and in all types of services but not often will a company send a brochure through the post as a way of prospecting. 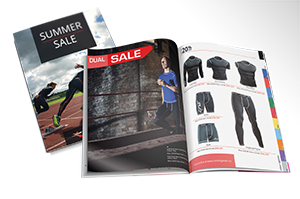 Brochures are a good way to have your business advertised to more than one person, they are often kept for future reading and are a good way for you to set your business at a different level from the rest. Interested in finding out more on our Brochure Design Services for your Products or Business? Please Contact Us for a free consultation on how we can help.